Ukraine's President Petro Poroshenko poses with European Commission President Jose Manuel Barroso (L) and European Council President Herman Van Rompuy (R) at the EU Council in Brussels, June 27, 2014. Ukraine's President Petro Poroshenko signed a landmark trade and economic agreement Friday with the European Union in Brussels, and said he would decide later whether to extend the unilateral cease-fire he announced a week ago in the military campaign against pro-Russian separatists. Poroshenko said Ukraine had paid "the highest possible price" to sign the free trade agreement with the EU. Calling the measure "historic," he said it was the second most important development in Ukraine following its creation with the 1991breakup of the Soviet Union. The EU-Ukraine Association Agreement is a political and economic cooperation deal that also frees up trade between Ukraine and the 28-member EU. 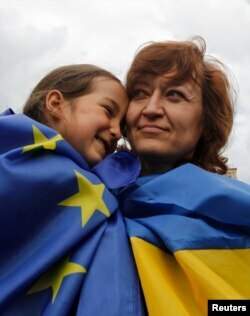 It brings Ukraine one step closer to possible EU membership, and another step away from Russian influence. Russia criticized Ukraine's move. Russian President Vladimir Putin -- who on Friday called for a long-term cease-fire in Ukraine as a condition for talks between Ukrainian authorities and pro-Russia separatists -- said the agreement has forced Ukrainians into an "artificial" choice between loyalties to Europe or Russia. A girl and woman, respective draped in European Union and Ukrainian national flags, celebrate in Independence Square in Kyiv June 27, 2014. Controversy over the agreement lies at the heart of the current crisis. It led to the February ouster of Ukraine's former pro-Russian president, Viktor Yanukovych. In March, Moscow annexed Ukraine's Crimean peninsula, where loyalty to Russia runs high. The conflict spread to eastern Ukraine, where deadly clashes broke out between pro-Russian separatists and Ukrainian security forces. The United States and EU imposed several sets of sanctions against individuals and companies, mainly Russian, in response to Crimea's annexation and Russian involvement in the unrest in eastern Ukraine. The U.S., European and Ukrainian governments have repeatedly called on Russia to prevent militants and weapons from flowing across its border with Ukraine to the separatists. The Ukrainian government's week-long cease-fire is set to expire Friday night, local time. Poroshenko told reporters in Brussels that he would decide after returning to Kyiv whether to extend it by three days. Some rebels said they would observe a truce concurrent with Kyiv’s cease-fire, but violence in eastern Ukraine has continued over the past week. Ukrainian President Petro Poroshenko has extended a unilateral cease-fire with pro-Russian separatists for three more days. Some of the rebels have said they would observe a truce as long as the Ukrainian military does. The EU is demanding the separatists and their supporters in Moscow take steps to de-escalate the crisis in eastern Ukraine -- including holding "substantial" peace talks and letting a European team monitor the cease-fire. At the Brussels summit, EU leaders set a Monday deadline for Putin to demonstrate support for calming the unrest in Ukraine. In a statement issued Friday, the 28 leaders called for Moscow to meet several conditions, including visibly supporting the Ukrainian government's proposed peace plan, the French news agency AFP reported. Ukraine's government also should be granted oversight of three major border checkpoints, Reuters reported. Two other terms according to the Associated Press, include setting up a means of verifying the cease-fire and securing the release of all captives. If Putin fails to meet those conditions, Russia could face "further significant restrictive measures," the statement said, according to AFP. German Chancellor Angela Merkel reportedly has warned Putin that the EU will consider a new round of sanctions against Moscow if it doesn't cooperate. The Obama administration says it also is ready to impose new sanctions if Moscow fails to take action to de-escalate the crisis in eastern Ukraine. The administration said it has delayed implementation as it presses for unified support from European and U.S. manufacturers for the measures. Meanwhile, rebels freed four international observers they'd seized in Ukraine last month, Reuters reported. Eight representatives of the Organization for Security and Cooperation in Europe had been detained while monitoring an agreement aimed at calming the conflict. The four were released to colleagues at a hotel early on Friday, Reuters said. . The agreement with the European Union brought out the push and pull between independence and belonging. On Friday, central Kyiv filled with revelers. Among them, a troop of men and women in mismatched camouflage uniforms held aloft an EU flag, a Ukrainian flag and a Ukrainian army flag -- three symbols that encapsulate Ukraine’s desire for independence, strength and unity with the rest of Europe. "Glory to Ukraine!" they yelled. "Glory to heroes! Glory to the nation! Death to enemies!" It's clear they're referring to Ukraine’s biggest neighbor. Ukraine has accused Russia of funding rebels in the east. Volunteers in makeshift military uniforms have swarmed to the conflict areas to defend Ukraine. A representative of Poroshenko’s office said last week that relations with Russia are at an all-time low. On Friday, Putin adviser Sergei Glazyev called Poroshenko a Nazi. Earlier in the month, Ukraine’s former foreign minister publicly denounced Putin. The new EU agreement ties Ukraine to Europe both economically and politically, and many Ukrainians say they hope their standard of living will rise as a result. Civilians wait in a bus to flee from the eastern Ukrainian city of Slovyansk June 25, 2014. In Kyiv, journalist Sergey Kolupov said he thinks the agreement will do even more. "I think," he said, "that Russia’s collapse starts from this signing, from the statements of Glazyev, who is not accepting our president’s legitimacy. It’s the biggest mistake in their country’s history." In the northeastern town of Sumy -- just 50 kilometers from Russia -- Volodymyr Shulga, head of the Sumy regional administration, told VOA his province is firmly European despite its close ties with nearby Russian towns. "I support the signing completely and think that today the majority of Sumy region residents do, too," Shulga said. Sumy resident Tatiana Viktorivna agreed, saying she envisions a better life through the EU. "I don’t know the details," she said, "but I know that Europeans live as human beings, not like us." For now, there is confusion and fear in eastern Ukraine. Fighting has escalated in recent weeks, with Russia sending tanks to the rebels across the border. With the end to the official cease-fire looming on Friday, witnesses said thousands of Ukrainians lined up at a Russian border crossing late Thursday, driving cars packed with personal belongings, in hopes of fleeing violence in eastern Ukraine. The United Nations refugee agency said Friday that some 110,000 people have fled to Russia from Ukraine, while some 54,000 Ukrainians have been displaced within the country. Georgia, Moldova also signed free trade agreements with the European Union Friday and EU leaders named former Luxembourg prime minister Jean-Claude Juncker as the next head of the European Commission. The selection of Juncker came over the objections of British Prime Minister David Cameron. Speaking with reporters about Juncker's political win, the British prime minister said “Let me be absolutely clear: This is a bad day for Europe." Cameron said the decision "risks undermining the position of national governments, it risks undermining the power of national parliaments and it hands new power to the European Parliament." In the near future exports from the three former Soviet bloc countries will gain duty free access to the 28 member EU countries. In response to the signing of the accords, Russian Deputy Foreign Minister Grigory Karasin warned “There will undoubtedly be serious consequences” for this "economic aggression". Terms of the EU agreements require Georgia, Moldova and Ukraine not enter into similar free trade agreements with the Kremlin.